We all know that underpinning Lambda is containers historically and now also with Firecracker, a Micro-VM. AWS handles the deployment, availability and scaling of all these containers. Lambda functions fire off when there’s an event trigger. Once the Event trigger is hit, Lamdba injects your custom node into one of these containers and it runs. Depending on what happens in the containers, the container may shut down or be used again for another NodeJS function within your Amazon account. As your code may contain libraries that need to be imported across the network as well as your code itself, it can take a little while for the container to actually get your code and run. Containers that use Java with JVMs also need to load into memory and this can take a few seconds depending on your dependencies. Worker Manger: tracks container idle and busy state and schedules incoming invoke requests to available containers. Shuts down idle containers, optimise for running of code on a warm sandbox. Worker: Provisions a secure environment for cluster code execution. Creates & manages a collection of sandboxes, manages multiple language runtimes. Tells the Worker Manager when it has provisioned a sandbox. Routing traffic across hosts distributed across AZs. Invoke goes through Front End, sent to reserved sandbox if it exists or deploys a sandbox to a worker manager and initiated on a Worker and its invoked with your code. Provision function capacity when needed and releasing when not needed. Workers are recycled when its lease expires, normally 6 hours. With Lambda, always have a healthy host. Isolation is for security and operational concern such as for consistent performance. Multiple Guests OS on a box, using a hypervisor, never use a sandbox across multiple functions, boundary across accounts is VMs. Firecracker adding much better utilisation for isolation. A single function executes in a single Firecracker micro-VM. Functions no longer share a container. Information on the hardware device emulation with Firecracker, very quick to add virtual hardware. 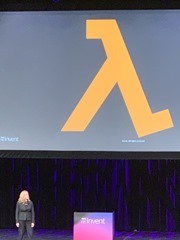 Coming with Lambda in 2019 = improving VPC start-up scaling, removing ENI from Worker to remote NAT, shared ENI between workers. Keeping servers busy = % of resources doing useful work. Want as much resources used for your code. With Lambda you only pay for useful work. you don’t need to worry about utilisation is AWSs problem, they do the optimisation to keep servers busy. 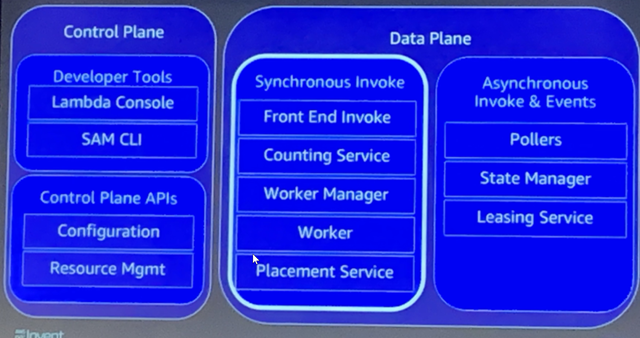 They use statistical multiplexing to put different (uncorrelated) workloads on a server, using the same workloads will have the have resource profile and then saturate something. There was so much more technical detail for this session, its worth watching the recording,I couldn’t get everything down in time!